Choose one of the four Peace Globe designs on her site. Sign the globe using Paint, Photoshop or a similar graphics tool. Decorate the globe if you wish. You can even include the name of your blog. Save it in JPG format. Return the globe to Mimi via email & she will place it in the film loop and gallery on the site. Post the globe in your sidebar for now if you wish or you can save it for Peace Globe Day which is June 6, 2007. On June 6, 2007 DISPLAY YOUR GLOBE IN A POST. TITLE YOUR POST "Dona Nobis Pacem" This is important. The goal is for all blog titles to say the same thing on the same day. WRITE ABOUT PEACE THAT DAY OR SIMPLY FLY YOUR GLOBE. Awesome. Thank you so much, B, for promoting and making this lovely globe. I have added it to the gallery and will wait with anticipation for your post on June 6th. Blogging is a beautiful thing. I love this blog. I'm going to link in to it. I hope you will reciprocate! yes indeed, wacky, check your email. A photo collection of pictures submitted from around the world, from people who want world unity. Please check the submission guidelines on how to contribute your picture(s) to The Unity Project. 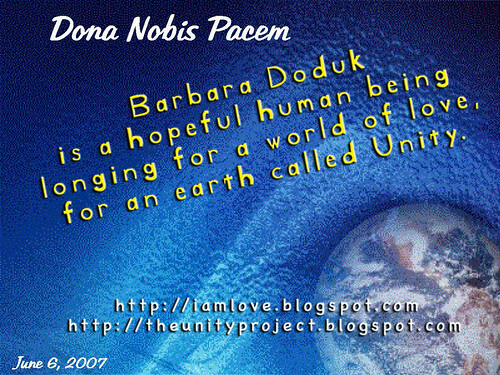 Barbara Doduk has had a web site since 1997, which included a journal. She started a web site to promote her creative writing, poetry and photography interests. Over the last 10 years the www has evolved and so has web journalling or as it is now known "blogging". In 2010 I became a mum and stopped blogging for the time being. THE LOVE BLOG is her main personal journal. WIREDSECRET is her poetry weblog. THE UNITY PROJECT is her world wide photograph collection for unity. will you find that money cannot be eaten. Blog designed by Barbara Doduk. A worldwide collection of Unity photographs submitted from around the world. The most fundamental question we can ever ask ourselves is whether or not the universe we live in is friendly or hostile. Click link to read my posts on RAPS. Sept 14th, 2008 B Raised $510. Sept 9th, 2007 B raised $230. Sept 10th, 2006 B raised $155. July 2007 I Couldn't Blog (Moving). July 29th, 2006 raised $208 for the WWF.